Every now and then, I look at around my shop and decide I need to make changes usually because I am out of space or I realize there are better ways to work. Recently I decided to downsize to a pancake style air compressor and add a retractable hose reel. 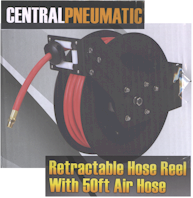 This is my review of the Harbor Freight Central Pneumatic item 93897 Retractable Hose Reel with 50ft Air Hose. I used a 20% off any single item coupon I had and paid US$62.39 before tax for this reel and hose. My main goal with the hose reel was to be able to get air anywhere inside my shop and at least far enough outside the garage to air up a vehicle or tractor parked immediately in front. I measured it out and 50 ft would do the job if I mounted the reel in the center of my shop. Installation was well illustrated in the manual and was pretty easy. I mounted the reel with the base down on a lower shelf of my workbench. No mounting bolts were supplied, but I have a good stock of 7/16” so with a bit of drilling I was in business. I measured this L-shaped bracket to be 5 mm thick. Giving some allowance for paint, this looks to be Number 6 gauge steel. Then, I had to remove the four plated bolts and realign the hose guide to match my installation. I wanted the hose entrance to be on the top of the reel. I liked how these bolts had nylon crowns to stay on once bolted in. I measure the hose guide to be 3 mm thick which looks to be Number 11 gauge steel. The hose impressed me but maybe because it was new and I was just used to my vintage hose which was at end of life. It will certainly handle anything I need it to. You need to provide your own hose to connect the reel to your air compressor (read my review of mine here ). That is fair enough as who knows how much run this could be. The hose has a standard brass ¼” NPT (M) connector which looks to be high quality to me. Once installed, payout from the reel had a good feel to me. The ratchet was loud enough that I could easily hear where the lock points were. Take in was smooth as well. The spring adjustment was dead-on based on my tests. However, I don’t think the L-bracket or the hose guide would stand up if mounted on a wall or roof if the hose was paid out at an angle or if the reel was in heavy use. Conclusion: For the money, I think this is a great value for a home or hobby shop and I am pleased with it.